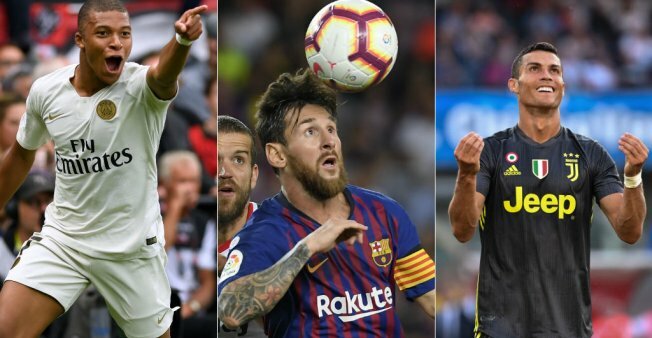 Paris prodigy Kylian Mbappé, Barça star Lionel Messi and Juve’s new star recruit Cristiano Ronaldo all debuted their football season with a win. Cristiano Ronaldo failed to score on his Serie A debut but champions Juventus won 3-2 at Chievo in his side’s opening match of the 2018-2019 league season on Saturday. Ronaldo, 33, who joined the Turin giants from Real Madrid last month in a deal worth 100 million euros ($114.5 million), clenched his fists with delight as his team earned all three points despite his four missed chances. “Happy for the first victory in the Juve jersey!” Ronaldo tweeted after the match. Italian Federico Bernardeschi scored the winner in injury time minutes after Chievo goalkeeper Stefano Sorrentino was knocked out and later hospitalised after colliding with the Portuguese superstar. “Everyone was waiting for the goal. It’s a shame he couldn’t score but Sorrentino denied him a couple of times. He was happy we got the win anyway,” said Juventus coach Massimiliano Allegri. “I’m happy with what he did and he’s happy with his performance. Brazilian left-back Alex Sandro added: “I feel at ease with him (Ronaldo), and he’s an excellent player. The champions were made to work after Germany international Sami Khedira opened the scoring after just three minutes at the Bentegodi Stadium for the seven-time defending champions. Polish striker Mariusz Stepinski headed in a 37th-minute equaliser for Chievo with Emanuele Giaccherini slotting in a penalty after 56 minutes following a foul by new Juventus signing Joao Cancelo. But Chievo’s Mattia Bani turned into his own net after 75 minutes following pressure from returning Juventus defender Leonardo Bonucci to pull the champions level. In a frantic finale substitute Bernardeschi scored the winner after Mario Mandzukic had a goal disallowed as a result of Sorrentino’s knock with Ronaldo. The Chievo goalie was stretchered off and his replacement Andrea Seculin immediately conceded the decisive goal. The 39-year-old’s wife posted a picture on Instagram with Sorrentino in hospital, wearing a neck brace, after suffering a suspected broken nose and concussion. “We let our focus dip after the first goal, we thought we had the match in the bag,” said Allegri. Two goals from Lionel Messi either side of a Philippe Coutinho strike allowed Barcelona to start their defence of the Spanish title with a 3-0 win over Alaves at the Camp Nou on Saturday night. Kylian Mbappé marked his first appearance for Paris Saint-Germain since winning the World Cup by coming off the bench to score a late brace that gave the French champions a 3-1 victory at Guingamp on Saturday. Nolan Roux had given the home side the lead in the Brittany sunshine, and only a combination of Gianluigi Buffon and VAR prevented Thomas Tuchel’s side from being further behind at half-time. But Mbappé came on for the second half and Neymar equalised from the penalty spot soon after, before the 19-year-old France starlet added two goals in the closing 10 minutes to secure the points. It is now two wins from two in Ligue 1 this season for PSG under new coach Thomas Tuchel, after they swept aside Monaco 4-0 to win the campaign-opening Champions Trophy in China. “I have very big objectives, so there is no time to loaf around,” Mbappé told Canal Plus at the end of the game. The capital side were again without a host of big names, including Edinson Cavani, the Uruguayan still not deemed fit to return after a calf injury suffered at the World Cup. Is haywire body clock tied to mood disorders?